History has shown time and again that individual leaders can make people feel as if they strolled through the great pearly gates of heaven or tumbled into the depths of hell. While that’s especially true in politics, it holds water in the world of business as well. A chief executive officer, like a president, can sink a sturdy ship - or salvage one already on the ocean floor. injecting a youthful, practical and results-based mentality into the company. Tongil Group was founded in the 1960s by Reverend Moon Sun-myung, who created the Unification Church. The group’s most prominent businesses today include Yongpyong Resort, a popular leisure complex in Pyeongchang, Gangwon; TIC, which produces axles for armored vehicles; and Segye Times (Segye Ilbo), one of Korea’s major daily newspapers. For decades, the group was something of a mystery to the general public. Its association with the Unification Church muddied up the picture, as many people weren’t sure about its true identity and motivations. But the company began to change shortly after Kook-jin -Moon Sun-myung’s fourth son - was inaugurated as chairman in 2005. The younger Moon initiated a major move to streamline the group’s businesses internally and stabilize it financially, while his external efforts involved sitting down with the press to clear up any questions surrounding the company. Also known as Justin, Moon was educated in the United States and holds a bachelor’s degree in economics from Harvard University and an MBA from the University of Miami. 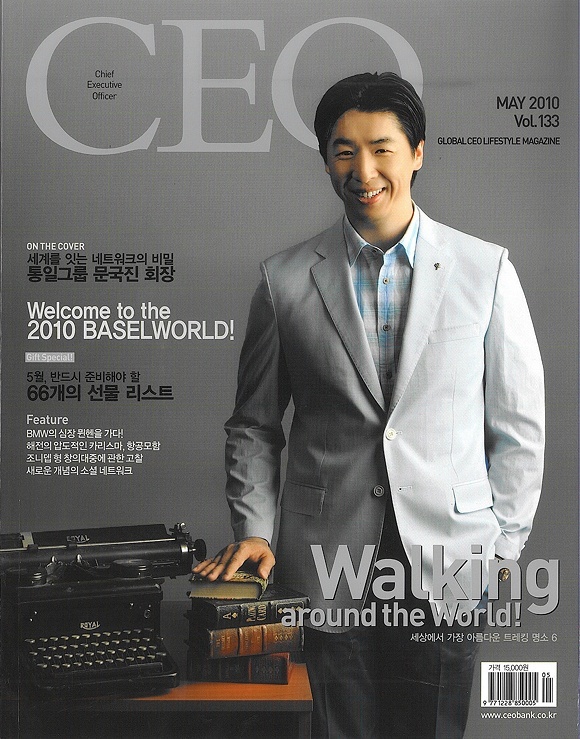 Aside from stories related to his work as the top executive of Tongil Group, Moon recently made headlines here when Korean media reported on his wife Park Ji-ye, a former Miss Korea, after she posed for a company advertisement wearing a revealing halter-neck dress while holding a shiny pistol. In a recent interview with the JoongAng Daily conducted via email, Moon - who was in the U.S. at the time - talked about the changes he’s brought to the group, the company’s relationship with the Unification Church and his business philosophy. Q. What are your management principles? Do you believe they have become part of the corporate culture at Tongil Group? A. We have five rules of management that we have been promoting in our group: results, accountability, clarity, productive conflict and trust. While it’s too early to say that they have become part of the culture of the group, the rules have given guidance to our employees on how they should behave and interact with other members of our group. In that sense, the rules have helped to improve the working habits and performance of our group. The first thing some people think of when they hear about Tongil Group is Tongilgyo, or the Unification Church. Please explain the relationship between the two. The Tongil Group is owned by the Unification Foundation, and the mission of the foundation is to support the Unification Church. I am a member of the church and the members of the foundation’s board of directors are members of the church. For these reasons, I can not foresee a situation in which the foundation and its business group could be completely separate from the church. Since the foundation and the church are married to each other, the better area to focus on is how to realize synergies between the two. The growth of the church will greatly support the growth of our business. The church spearheads many educational activities that use our leisure facilities, and our members are a loyal customer base for the consumer products that we produce. Different people bring different leadership styles to companies. How would you say your style differs from those of other chairmen? I do, as an individual, have my own leadership style that differs from other chairmen we have had. I tend to focus on results and actual data rather than on personal relationships. Furthermore, I try to simplify complexity and strive for clarity in the organization. In that sense, my leadership style is quite predictable and “common sense.” Given my simple-mindedness, I am grateful that I have people who are much more capable than myself working for me. You have run businesses both in the U.S. and in Korea. Is there a difference between the two in terms of how people run businesses? Also, isn’t it challenging to run a big conglomerate with many affiliates in Korea? Before I started my work here in Korea, I was told by many that “doing business” in Korea and the U.S. were very different, but from my experience working in Korea I have found that there are more similarities than differences. Business success in both countries is a function of how well the people in the business work together to pursue a common goal and mutual interest. It’s been five years since you were inaugurated as the new chairman of Tongil Group. Tell us about the challenges you’ve faced as well as your achievements. We have carried out a successful restructuring of our business. We have assisted in the rationalization of the church’s administration. We have successfully led the fund-raising campaign to build our head church. And we have managed to lead our business group through a difficult world economic crisis. However, we still have issues to overcome. Although our group’s performance has improved and stabilized, we still do not have a growth engine that we can look to with confidence. Our leisure business represents the largest share of our business portfolio, but the industry requires a great deal of investment and is very challenging operationally to bring a return on investment. Nonetheless, I am optimistic and encouraged by the development of our employee’s dedication and skill in performing their job duties. It is their conviction and sacrifice that have permitted us to come this far, and it is their efforts that will lead our group to overcome future challenges that we certainly will face. How was 2009 for Tongil Group? Also, what’s down the road? The year 2009 went as we planned. We focused on improving group liquidity rather than on profits. As a result, our group has been able to ride out this economic crisis without undue difficulty. As the economy stabilizes, we will be shifting our focus back to profit and growth. We hope that the world economic situation will permit us to make this change soon.